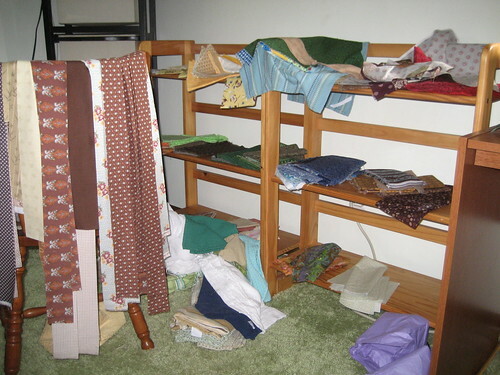 Judy from Patchwork Times asked to see her readers’ stashes. Oh my. Some of these folks are amazingly organized with vast libraries of fabric. Take, for example, her own stash. Holy. Smokes. Given I’ve been at this for, what… maybe two months?… I have accumulated more than I would have expected. 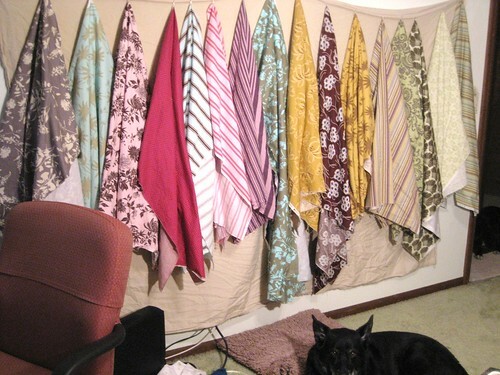 Well, here are my piles and hangings of fabrics that pass for a “stash” thus far (one of her admonishments was “no cleaning or tidying.” Some stuff you can’t see, cuz it’s buried. The sparse little shelves with my fat quarters on them, and a bunch of strips I pressed and cut yesterday. Someday, I’ll figure out how to organize all this stuff. 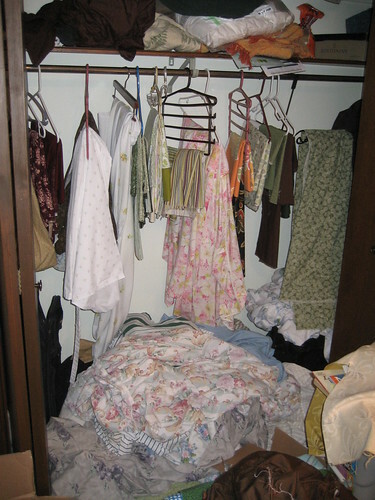 4 responses to "Show Us Your Stash"
Since you’re a newbie you have the advantage now of looking at everyone else’s stash storage and picking and choosing what will work for you! Kare and Marlene – Hi! Indeed, I’m taking notes as I look around. 😀 Lisa, Elizabeth will be off to college before you know it… how crazy is that? !